He will oversee an experienced and diverse sales team focused on providing industry-leading customer service, working especially with North American and International Market Directors John Reedy and Mike Munro. As powertrain heavyweight Detroit observes its 80th anniversary in 2018, parent company Daimler Trucks North America LLC is marking another important achievement: Production of its one millionth heavy-duty engine platform (HDEP) engine. The engine is a shared milestone between Detroit’s Redford, Mich.-based manufacturing facility and Daimler AG’s Mercedes-Benz plant in Mannheim, Germany. Introduced in 2007, HDEP was jointly developed in Germany, Japan and the United States. HDEP engines have 90 percent shared parts worldwide, which has resulted in significant cost savings and uptime efficiencies. The first HDEP engine in North America was the Detroit DD15 engine, which today leads the industry with more than 60 percent market penetration and best-in-class fuel efficiency. The DD13 and DD16 engines were later introduced to meet the needs of additional heavy-duty applications. “Detroit will continue to leverage the power of Daimler’s global resources to push the envelope with transformative technology and products so that we can exceed customer expectations in all dimensions,” affirms DTNA Powertrain Engineering Head Rakesh Aneja. Meritor, Inc. has opened a fourth North America aftermarket distribution facility, the Eastern Canada Regional Distribution Center in Mississauga, Ontario, to fulfill orders from warehouse distributors and dealers. The facility stocks Meritor Aftermarket’s complete brand portfolio for customers in Manitoba, New Brunswick, Newfoundland and Labrador, Nova Scotia, Ontario, Prince Edward Island and Quebec. Unit-down orders in these provinces will be fulfilled from the Mississauga warehouse. Meritor’s Edmonton, Alberta, facility will continue serving western Canada aftermarket customers. The Florence, Ky., location fulfills orders in the eastern United States, and the West Coast Aftermarket Distribution Center in Santa Fe Springs, Calif., serves U.S. warehouse distributors and dealers in 13 Western states. Fox Blocks, Nebraska-based insulating concrete form manufacturer, has adopted the Helix Steel Twisted Steel Micro Rebar, a three-dimensional concrete reinforcement solution, in its specification. The product will provide Fox Blocks customers added strength, resiliency and durability in ICF walls. Over the past year, teams from Fox Blocks and Helix Steel, Ann Arbor, Mich., have collaborated from a design and engineering perspective, culminating in a strategic partner alliance. iQ Power Tools, a manufacturer of concrete- and masonry equipment with integrated dust collection, has appointed Vince Hollis as national product training manager. He will be in charge of product information and training for dealers and field representatives; serve as trainer at industry gatherings; and, participate in regional events with Interlocking Concrete Pavement Institute, International Masonry Institute and Mason Contractors Association of America. Fiber cement siding demand is forecast to grow 3.3 percent per year, to 2.1 billion square feet by 2022, and support sales volume that continues to outperform that of most other siding products. Led by Elementia, James Hardie and Nichiha, the market for fiber cement siding and companion building products will reach $1.6 billion in 2022, reflecting price increases and a shift to higher value offerings. These and other trends are presented in “Fiber Cement in the US, 3rd Edition,” a new study from Cleveland market researcher Freedonia Group. Growth in fiber cement sales will come from three main areas, the study finds: strength in U.S. residential and commercial building; gains in market share, especially at the expense of vinyl siding; and, product improvements, including the introduction of premium siding grades. The market for fiber cement siding totaled 1.8 billion square feet ($1.2 billion) in 2017, accounting for 70 percent of total fiber cement sales. Fiber cement is the second most widely used type of siding behind vinyl, and has captured an expanding share of the overall market largely due to its aesthetic and performance advantages over vinyl, hardboard, and natural wood. Backerboard is responsible for the second largest share of fiber cement demand, accounting for 25 percent of sales. Moulding and trim round out much of the remaining product applications. 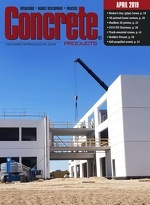 “Fiber Cement in the US, 3rd Edition” (May 2018, 137 pages) is available for $5,300 from Freedonia Group, 440/684.9600, www.freedoniagroup.com. Fly ash marketer and coal combustion byproducts management specialist Charah Solutions Inc., Louisville, Ky., has begun trading on the New York Stock Exchange under the symbol, CHRA. In a mid-June initial public offering, the company and key stockholders raised $88 million through the sale of 5,294,117 and 2,058,824 shares, respectively. The pool represents an approximately 23 percent stake in a business that reported 2017 sales of $430 million from two segments: Environmental Solutions, anchored by fly ash and bottom ash management and marketing contracts at coal-fired power stations; and, Maintenance and Technical Services, geared to fossil fuel- and nuclear-powered facility operators. The IPO follows a major growth phase for Charah Environmental Solutions. Over the past four years it has expanded a legacy, Mid-Atlantic and Midwest-centered fly ash processing and distribution footprint to points west and north. Since January 2017, Charah has built up its MultiSource network for Classes F and C ash and slag cement marketing through new management contracts at Indiana, Michigan, New York and Pennsylvania power stations, plus Colorado and Louisiana terminal construction. Earlier this year, it added ash beneficiation and mineral grinding technologies by acquiring Connecticut-based SCB International. Fueling the development surge has been Bernhard Capital Partners, which acquired a 76 percent Charah stake, totaling $104 million, in January 2017. In Securities and Exchange Commission filings, management notes that after the IPO, major shareholders will include Bernhard Capital, 51.4 percent of shares; CEP Holdings, 15.3 percent; and, Management, 8.8 percent. The $50 million-plus Charah received from the IPO will be earmarked for repaying term loan borrowings and general corporate purposes.